Dr. Corey Martinez is from Fort Wayne, IN. He attended Manchester College for his undergraduate studies, and it was during his junior year he met his wife Mary Bellinotti, a Sweetser, IN native. Dr. Martinez knew he wanted to be in the field of healthcare early on, but it wasn’t until he met Dr. Mark Shafer that he knew he wanted to become a dentist. It was then he realized the impact that he would be able to have on his patients and their overall health, while wearing the other hats necessary to have a fulfilling life. 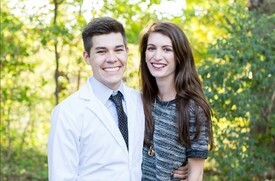 Mary took a leap of faith and moved to Indy, with him while he attended IU School of Dentistry. She supported him throughout dental school, and it was near the end of his first year that the two married. While in dental school Dr. Martinez found a fascination with Oral Surgery and Endodontics, but enjoyed the personable approach that was required in general/family practice. After graduation Dr. Martinez spent time in private practices in Indianapolis, and a corporate office. This gave the couple the ability to form a vision for their very own practice. The vision being completely patient centered, offering them the best care with the best in office experience. As office manager, Mary wants to ensure your visit is exceptional, and any shortcomings or praise can be directed to her so they can be addressed and celebrated accordingly. Dr. and Mrs. Martinez are huge supporters of dog rescues, and are very excited to integrate into the community. In their spare time they enjoy playing with their two rescue dogs (Theo and Norma), spending time with family, and living adventurously. They are excited to meet you and work with you to create the smile you want. Dr. Martinez is a member of the American Dental Associate, Indiana Dental Association, Academy of General Dentistry, and the American Academy of Cosmetic Dentistry. Dr. DeaKyne grew up in Fortville, Indiana and graduated from IU School of Dentistry in 1987. He has been married to his wife (Shelbia) for 31 years. They have 4 children, who have blessed them with 5 grandchildren. Dr. Kevin practiced in Warren, IN for 29 years. He is a member of the American Dental Association, Indiana Dental Association, and Isaac Knapp District Dental Society. His family attends the Warren United Church of Christ. When Dr. Kevin isn't in the office he enjoys golf, hiking, IU sports, and music.